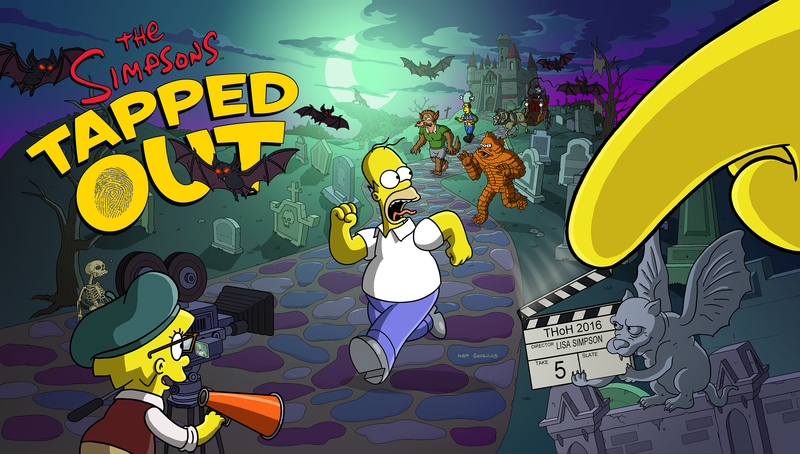 Battling monsters, filming, monsters everywhere, Springfield is full of action, preparing itself for the big milestone of the 600th episode of the show! Join us right after the jump for the 2nd part of the walkthrough for Act 1 of the event! Store notice: The THOH Flashback Bundle #1, containing Ghost Pirate Airship, Ghost Zapper and Mausoleum x2, is now available! Homer: Those monster actors are real jerks. Homer: Just because they’re better actors than me doesn’t make them better actors than me. Barney: Some stars get by without being good actors. Like the way Meryl Streep sang in “Mamma Mia”. Homer: Great idea! No one is better at being the center of unwanted attention than me. The only acting teacher I need is getting drunk to the point of foolish decisions! 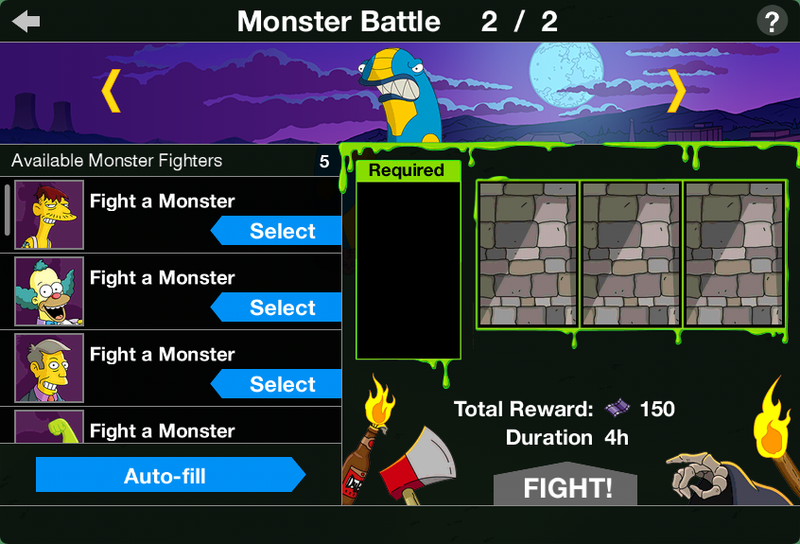 Tapping those rats is not the only way you can earn it however, as you can now fight some monsters by sending your characters against them. Filmmaker Lisa: Now that I’m a filmmaker, who should I style myself after? Kurosawa? Fellini? The not-crappy Spielberg films? Homer: Hey Lisa, did you film me when I used socks as oven mitts to put a can of gravy in the microwave and it exploded? Then I used the socks as napkins and bandages. Filmmaker Lisa: I guess I’ll be whoever directed the “Jackass” films. Homer: I love those! One guy snorted wasabi! Filmmaker Lisa: Dad! You keep walking into my shot! Homer: Do I? Or is the camera drawn to me like a magnet to… uh whatever magnets are drawn to? Is it cardboard? Filmmaker Lisa: It’s metal. And it’s you walking into my shot. Homer: I’m pretty sure both of those are wrong. Now, film me as I fight this pile of scales! You know I’ve broken every scale I’ve ever met. Death: You people are supposed to be believably fighting these monsters but your acting is horrible. You know what I’m seeing die? Art. Krusty: Who cares? I don’t do art. I do comedy – it’s way easier and pays better. Death: I’ve seen your show. There’s not a lot of comedy. Even the canned laughter sounds unsure what it’s playing for. Death: How about trying to learn some stunt acting? Do it and I’ll keep all your houseplants alive a week longer than planned. Homer: I’ve been fighting all day and I’m still not a world famous superstar! I don’t endorse a Japanese cologne or anything. Ned: Maybe that’s because you’re chasing the camera instead of fighting? Ned: How about joining us and helping the Hollywood monsters fight? Any religious person knows that supporting Hollywood is always the right choice! Homer: Bart get his kite out of a tree. Filmmaker Lisa: I’m halfway through editing this and it’s a disaster. Filmmaker Lisa: Not even a monsters attacking people disaster, which I want, but a bland mush with no emotional core. Filmmaker Lisa: I’m not giving up. With new footage it’ll come together, or fall apart to the point I can tell people it’s an art film and that they “just don’t get it”. System Message: The story will continue in Act 2. 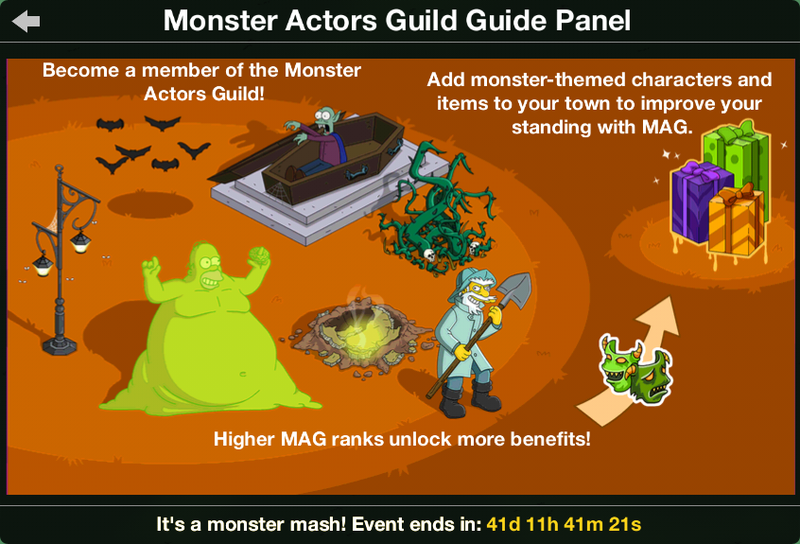 Keep fighting monsters and trick-or-treating to get more prizes and level up your MAG membership! The first act of the story ends here, and the story continues in Act 2 on October 18th. After unlocking Milhouse’s Trick-or-Treat job, after collecting one MAG Point, more probably by doing your first new craft (only crafting new items count toward Mag Points), the MAG prizes unlocks! Blinky Monster: The Monster Actors Guild is now welcoming human members. You eat enough cars, you need a well-funded dental plan. Filmmaker Lisa: That’s very reasonable of you. Blinky Monster: Yeah, whatevs. I’m generous like that, and still, people call me a monster. I may not feel bullets, but that doesn’t mean I don’t have feelings, you know? After completing Lost in La Monstra Pt. 2, you can now place cameras over your friends buildings and collect currency that way too. Not getting rewards for winged rats. Just started spawning today. Is this a glitch or am I doing something wrong? 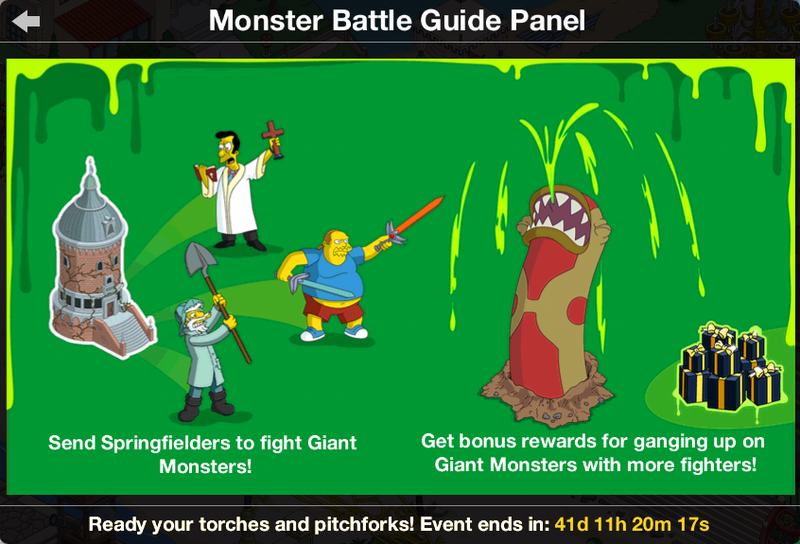 How do I get more towns people to fight monsters….I have six monsters and the maximum of four fighting them? Besides the Squeaky Voiced Teen being able to Trick or Treat, who else can do this without being unlocked via Obol Progression? Why are my MAG points stuck at a certain number, for the 4th day? Nothing I build anymore gives MAG points. I am stuck at needing 200 oboles, even though I’ve repeatedly gone far above that number, and still cannot unlock the corresponding “prize”. How on earth do I get MAG points now?? 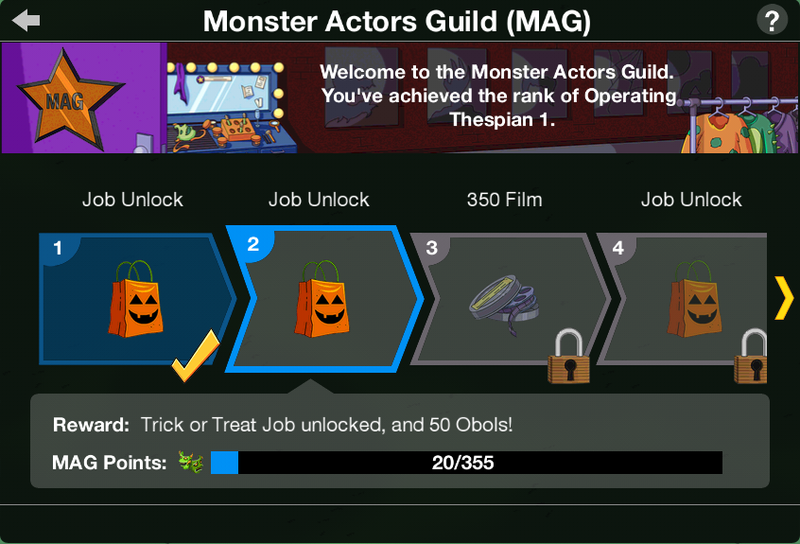 are you sending the kids trick or treating to earn obols? I don’t see the bundle available. I do have 2 of the 3 items available. I don’t have ghost zapper though. Is it possible if I have one of the items in the bundles, then I can’t get any of the items in the bundles?